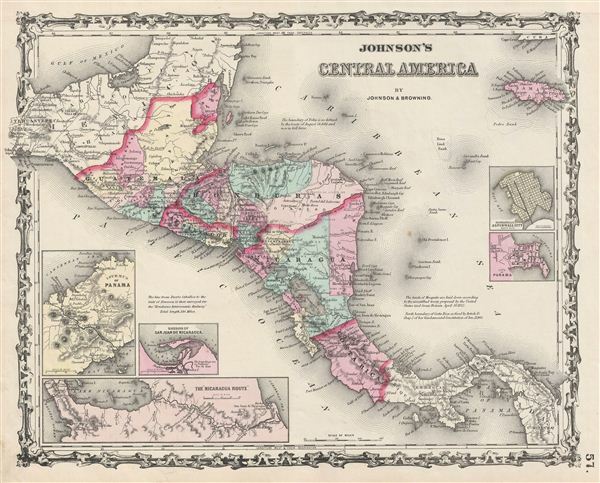 This is A. J. Johnson and R. Browning's 1861 map of Central America. Covers Central America from the Isthmus of Tehuantepec, Mexico to the Bay of Panama. Shows the countries of Guatemala, Honduras, el Salvador, Nicaragua, and Costa Rica. Jamaica appears in the upper right corner. Shows proposed roadways, cities, rivers, and ferry crossings. The lower left hand quadrant features three inset maps. In a clockwise fashion from top left these detail the Isthmus of Panama, the Nicaragua Route to the Pacific, and the Harbor of San Juan de Nicaragua. Two additional insets on the right hand side of the map show Aspinwall City and the City of Panama. Based on a similar 1855 map by J. H. Colton. Features the strapwork style border common to Johnson's atlas work from 1860 to 1863. Published by A. J. Johnson and Browning as plate number 57 in the 1861 edition of Johnson's New Illustrated Family Atlas. This is the last edition of the Johnson Atlas to bear the 'Johnson and Browning' imprint. Subsequent editions reflect Ward's 1862 acquisition Ross C. Browning's shares in the firm. Johnson, A. J., Johnson’s New Illustrated Family Atlas, with descriptions, Geographical, Statistical, and Historical. , (Johnson and Browning, New York) 1861.